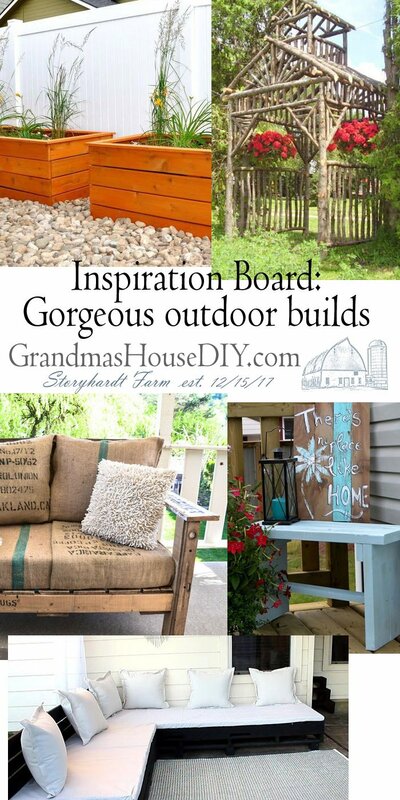 Hometalk's Outdoor Projects I Can't Wait to Build! Do it Yourself! I have SO many plans for my yard this summer and not just replacing my grass with clover but also allowing many portions of my lawn to go back to the wilderness. I want to create a haven here for the wild life as well as the humans too. 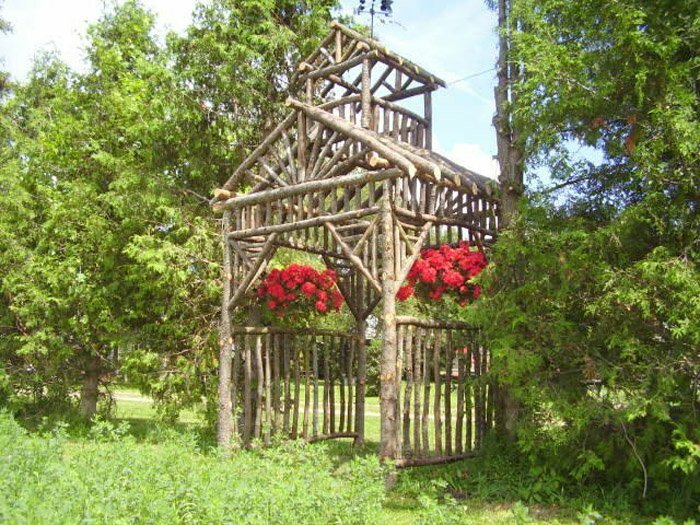 One specific spot I have would be absolutely PERFECT for this arbor! Hometalk project submitted by John Looser – click the pic for more information! After completing my Indoor to Outdoor furniture I was still left wanting something built in, bigger and a lot more sofa like. As usual, however, I am holding myself back as the many plans I have for my deck in the future would mean such a large piece would end up in the way. My dream is (someday) to build a screened in porch off the back of my kitchen, essentially cutting part of my deck in half. Once that is built (with a bar inside of course!) I’ll know my exact measurements for a built in sofa like this one! Hometalk project submitted by Angela East – click the pic for more information! 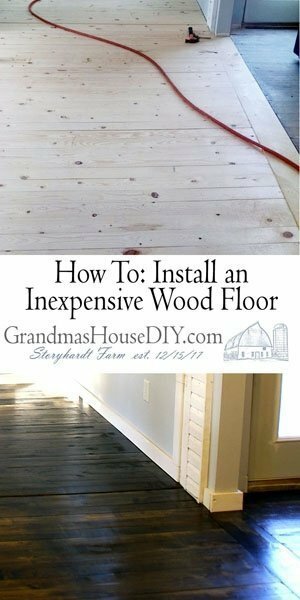 With my mom’s new house build coming up in the next year or two (OMG You guys I can’t wait to show you the plan I made for her, we are SO excited!) 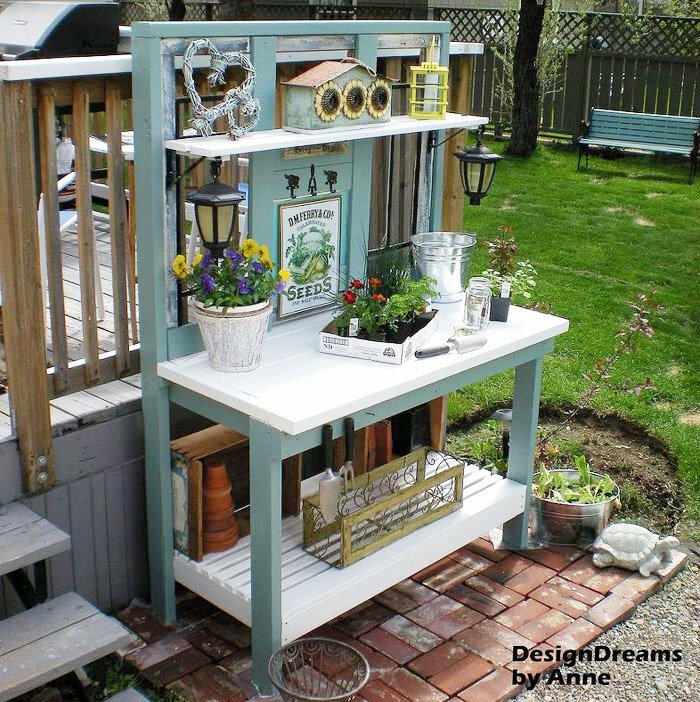 a potting bench is on the list of the MANY things I just can’t wait to build for her. 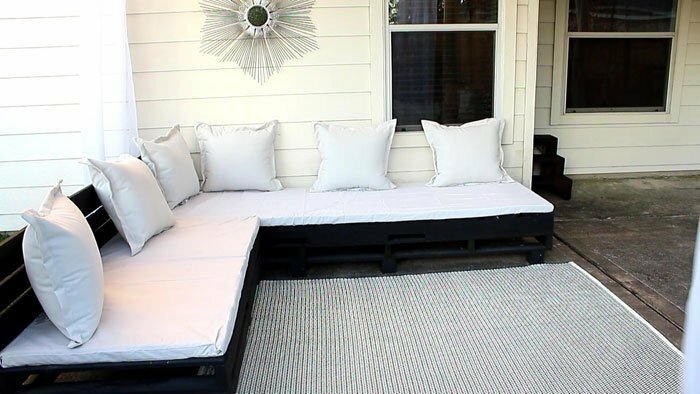 This one is a good example of what I’m planning on building however I will be positioning her’s at an outdoor spigot so I can include a sink too! Hometalk project submitted by Anne @ DesignDreams by Anne – click the pic for more information! 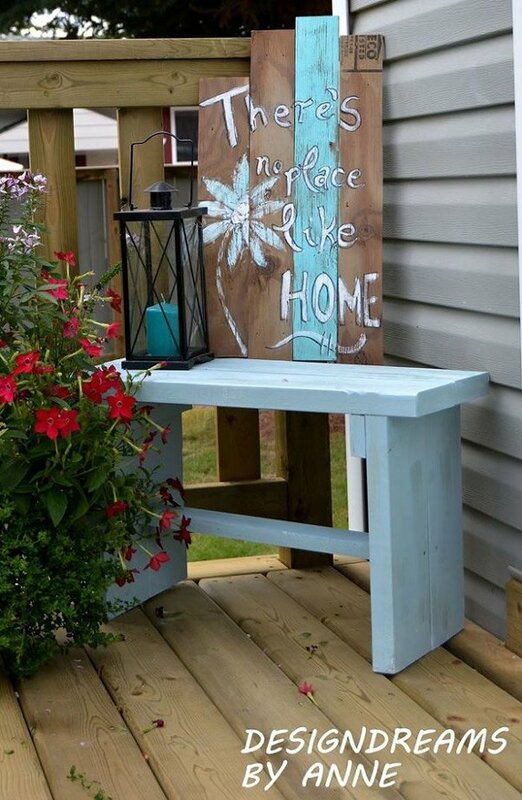 No list of outdoor projects would be complete without at least one simple bench that anyone can make. I’ve made several different styles of benches over the years but this plan is hard to fault. 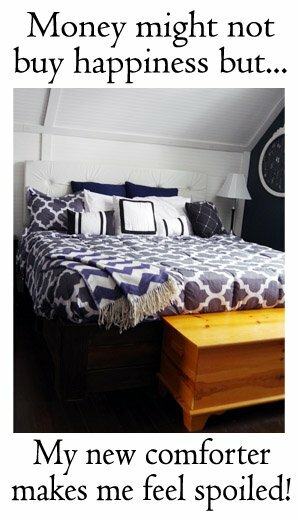 Yes it is very simple but simple also means its going to LAST and don’t you just love that pretty blue paint color?! Not to mention, this one only cost $8! It never fails with me that when I dream of my yard and outdoor projects that I want to build I also end up thinking of little nooks and hideaways to cuddle up, read a book and enjoy nature at its finest. It always includes something that is easy to build and creates a great cozy sitting place that you wont want to leave until the night forces you to go in! 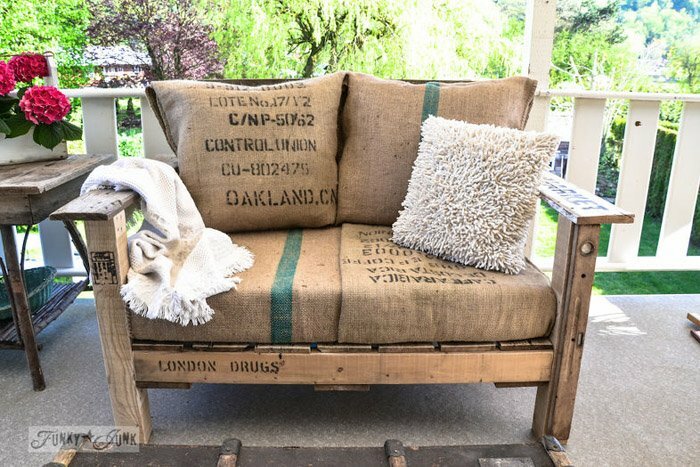 I love their choice here of the burlap sacks as pillows! Hometalk project submitted by FunkyJunk Interiors – Donna – click the pic for more information! This next project is an example where simplicity and the right color stain can make a simple box became a show stopping statement piece. 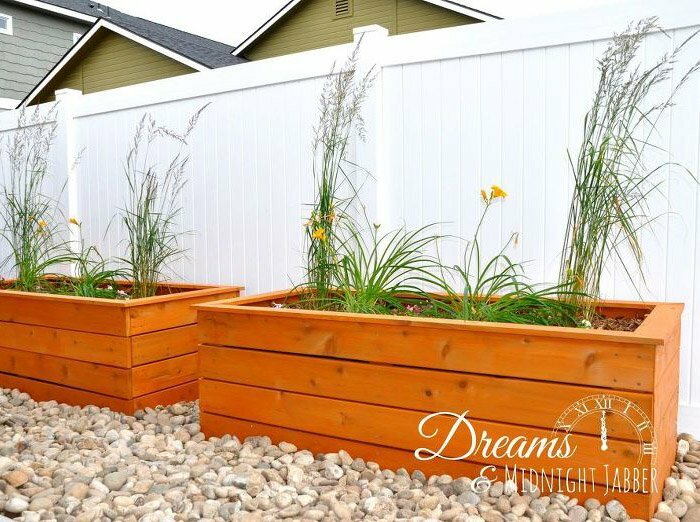 These planter boxes are absolutely gorgeous and are even making me reconsider my choice of Dark Walnut stain by Minwax ALL of the time. I also love the idea that these boxes are not sitting on lawn that need to be mowed at some point or another. That is literally always what makes me reconsider planting boxes because, dang it, weed wacking gets really tiring after awhile! Hometalk project submitted by Dreams & Midnight Jabber – click the pic for more information! Are you feeling inspired yet? I know I am! I also know I need to keep on pacing myself because of two VERY good reasons: Budget and I’m only one person lol I remind myself (constantly) to focus on the not-so-fun-stuff that needs to be done first like finishing my garage because my ex husband always said he would get to it (right) now I need to not only finish but also fix it where he didn’t put in the steel eves correctly. And also I need to clean out and ORGANIZE my garage. How long will that all take? Maybe a day, but when I’m looking at outdoor projects like the ones I just mentioned it is REALLY hard to get my chores done first!! I’m glad you decided to laugh off your irritation at being called crafty. It was said, I’m sure, in admiration not condescension as in cute kindergarten arts & crafts. As defined by Merriam-Webster: skillful, clever. Skillful! (No gender implied) Canny, clever. 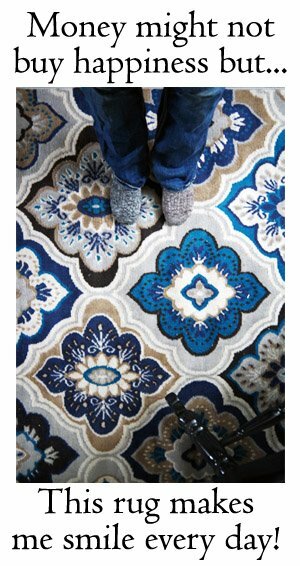 Many of your readers enjoy your clever, budget- and environmentally-friendly solutions and your artistic decorator’s eye in creating a home that brings you joy! Please continue to share your creations! Thanks Lace for coming by and commenting! You’re welcome to drop by for a cup of inspiration yourself anytime. Thank you Jennifer, have a lovely weekend! Thanks Madeline, have a lovely week!